This Lease (“LEASE”) is made as of _________________, ("EFFECTIVE DATE") by and between COMMERCIAL PROPERTY LANDLORD, INC., a __________________ corporation (“LANDLORD”), and AGREEABLE BIOMEDICAL TENANT, INC., a _________________ corporation (“TENANT”). A. PROJECT. Landlord is the owner of the real property commonly known as __________________________ ("PROJECT"). B. LEASE. Landlord and Tenant desire to enter into a lease for a portion of the Project under the following provisions and conditions. 1.1 "LANDLORD" is defined above. 1.2 "TENANT" is defined above. 1.3 "ORIGINAL TERM" shall commence on the Commencement Date and shall continue for ten (10) years thereafter. 1.4 "MONTHLY RENT" shall be $____ per month per square foot of Floor Area of the Phase I Premises (as defined in Paragraph 1.9 hereof), subject to adjustment pursuant to PARAGRAPHS 4.5 AND 5.2 below. The Monthly Rent shall be $____ per month per square foot of Floor Area of the Phase II Premises, subject to adjustment pursuant to Paragraphs 4.4, 4.5, and 5.2 below. 1.5 "COMMENCEMENT DATE" shall be (subject to Paragraph 4.1 hereof) the later of the following: (i) four (4) months after Tenant obtains the building permit for the Landlord Improvements (as defined below) ("SCHEDULED COMMENCEMENT DATE"), or (ii) the date by which Landlord delivers to Tenant possession of the Phase I Premises with the improvements substantially complete as provided in PARAGRAPH 4.6 below. 1.6 "PHASE II COMMENCEMENT DATE" shall be the date that Landlord delivers to Tenant the Phase II Premises, which shall occur on ____________. 1.9 "PREMISES" initially are those outlined on EXHIBIT "A" consisting of approximately ____________ rentable square feet of Floor Area ("PHASE I PREMISES") in that certain building ("BUILDING") located at the Project. As of the Phase II Commencement Date, the Premises also shall include the premises of the approximately __________ rentable square feet of Floor Area described on EXHIBIT "A" attached hereto ("PHASE II PREMISES"). 1.10 "TENANT'S PERCENTAGE" shall be (i) from the Commencement Date until the Phase II Commencement Date, the ratio of the rentable square feet of Floor Area of the Phase I Premises to the rentable square feet of Floor Area of the Project, as Landlord may reasonably determine; and (ii) after the Phase II Commencement Date, the ratio of the rentable square feet of Floor Area of the Premises to the rentable square feet of Floor Area of the Project, as Landlord may reasonably determine. 1.11 "SECURITY DEPOSIT" shall be an amount equal to the greater of the following: (i) ___________________ Dollars ($_______), or (ii) four months of Monthly Rent for the Phase I Premises and Phase II Premises. The Security Deposit shall be due upon the mutual execution of this Lease and is subject to increase pursuant to PARAGRAPH 4.4 below. 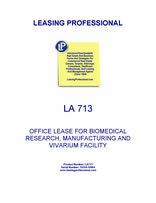 1.12 The specified use of the Premises (i) is general office, biomedical research and development (including vivarium and biomedical manufacturing and any other legal related uses) and (ii) other uses approved by Landlord (which approval shall not be unreasonably withheld) and in compliance with all Applicable Law. 1.13 The Broker representing Tenant is _____________________, and representing Landlord is ____________________. 1.14 "RENT COMMENCEMENT DATE" shall be the Commencement Date. No Monthly Rent shall accrue on the Phase II Premises until the Phase II Commencement Date. 1.15 Tenant shall be entitled without charge during the Term to the greater of (i) three (3) parking spaces per each 1,000 rentable square feet of Floor Area of the Premises, or (ii) the minimum number of spaces required by law for Tenant's use. Tenant's parking shall include Tenant's pro rata share of non-reserved parking spaces in the parking facilities established by Landlord for visitor (to be designated in a location mutually agreeable to Landlord and Tenant) and handicapped parking. 1.16 "TENANT'S REPRESENTATIVE" shall be ____________. Tenant agrees that Landlord can rely on any written notice or approval by the Tenant Representative as conclusively binding upon Tenant. 2. PREMISES. Landlord leases the Premises to Tenant, and Tenant hereby leases the Premises from Landlord for the Original Term, subject to the provisions contained herein. Landlord reserves the right, exercisable upon notice to Tenant and without liability to Landlord, to change the name and street address of the Project. Except as expressly set forth herein, Landlord makes no representations, express or implied, with respect to the legality, fitness, or desirability of the Premises for Tenant's intended use. 3.1 OPTION TO EXTEND. Tenant, at its option, may extend the Original Term for one (1) separate and additional period of five (5) years ("EXTENDED TERM"), subject to PARAGRAPH 3.2 below. The Extended Term shall be on the same terms and conditions (except for Monthly Rent and as otherwise expressly provided in this Paragraph 3) set forth in this Lease. The option to extend shall be exercised by Tenant giving written notice to Landlord at least One Hundred Eighty (180) days but not greater than three hundred sixty (360) days prior to the expiration of the Original Term. Upon such exercise, this Lease shall be deemed to be extended without the execution of any further instrument. "TERM" shall refer to the Original Term of this Lease as so extended. 3.2 LIMITATION ON EXERCISE. Notwithstanding the foregoing, Tenant's right to exercise an option for an Extended Term is expressly conditioned on at the time Tenant attempts to exercise an option to extend pursuant to this Lease, Tenant shall either not be in default under this Lease, or if in default, shall not fail to cure such default after notice and expiration of the applicable cure period. If the foregoing condition is not met, then any attempt by Tenant to exercise an option to extend hereunder shall, at the election of Landlord upon written notice to Tenant within ten (10) days after the date of Tenant's election, be null and void and this Lease shall terminate on the expiration of the then current Term. Further, if Tenant is in default beyond the applicable cure period on the date the Extended Term is to commence, at Landlord's election, upon written notice to Tenant within ten (10) days after the date the Extended Term would otherwise commence, the Extended Term shall not commence and this Lease shall terminate on the expiration of the Original Term. 3.3 RENT DURING EXTENDED TERM. The Monthly Rent during the first year of the Extended Term shall be the fair-market rent of the Premises as Tenant and Landlord shall reasonably agree or as otherwise determined in accordance with the provisions of this Paragraph 3.3, but in no event shall the fair-market rent be less than the Monthly Rent payable immediately prior to the Extended Term ("FINAL TERM RENT"). If Landlord and Tenant are unable to establish the fair-market rent within one hundred twenty (120) days in advance of the commencement of the Extended Term, the fair-market rent shall be determined by a single MAI certified real estate appraiser ("APPRAISER") jointly selected by Landlord and Tenant. If they cannot in good faith agree to a single Appraiser within one hundred (100) days prior to the commencement of the Extended Term, the fair-market value shall be determined by a majority of three Appraisers, one selected by Landlord, one selected by Tenant, and one selected by the two previously selected Appraisers. Within ninety (90) days prior to commencement of the Extended Term, Landlord and Tenant each shall give notice of its selection of an Appraiser to the other party. If either Landlord or Tenant fails or refuses to select an Appraiser within ten (10) days after receipt of written notice of the other party's selection of an Appraiser, the fair-market rent shall be determined by the single Appraiser selected. The Appraiser (or Appraisers) shall determine the fair-market rent as soon as possible. If a majority of the three Appraisers are unable to agree upon the fair-market rent within thirty (30) days after the appointment of the first Appraiser, the fair-market rent shall be an amount equal to the average of the three values determined by the Appraisers, excluding any fair-market rent which is ten percent (10%) greater than or ten percent (10%) less than the middle value. As used herein, "FAIR-MARKET RENT" shall mean the price that a ready and willing tenant would pay as Monthly Rent to a ready and willing landlord if the Premises were offered for lease on the open market for a reasonable period of time and shall be the product of the fair-market monthly rental rate per rentable square foot multiplied by the rentable area of the Premises. The fair-market rent shall be determined by (a) the quality and prestige of the Premises, including all improvements to the Premises made at Landlord's expense, (b) recent monthly rental rates for buildings of similar quality, size and location in ____________, (c) the duration of the term, (d) Tenant's obligations to pay additional rent under this Lease, and (e) the financial strength of the tenant and any guarantors. In determining fair market rent, the appraisers shall not consider any alterations or improvements installed in the Premises at Tenant's expense. Landlord and Tenant each shall pay for the Appraiser so appointed by such party, with both Tenant and Landlord jointly paying for any jointly appointed Appraiser. Until such determination of the fair-market rent, Tenant shall continue to pay the Monthly Rent immediately payable prior to commencement of the Extended Term; provided, however, the Monthly Rent shall apply retroactively to the beginning of the Extended Term. 4.1 FAILURE TO DELIVER. If the Landlord, for any reason whatsoever, fails to deliver possession of the Premises to Tenant at the commencement of the Original Term, this Lease shall not be void or voidable, nor shall Landlord be held liable to Tenant for any loss or damage resulting therefrom, except that Monthly Rent and other charges under this Lease shall be abated until the Premises are delivered to Tenant. Notwithstanding the foregoing or anything to the contrary in this Lease, if the Commencement Date has not occurred for any reason whatsoever on or before the sixtieth (60) day following the Scheduled Commencement Date (except if such delay is resulting from Tenant delays or force majeure events), Tenant shall have the right to terminate this Lease following written notice from Tenant to Landlord; provided, however, Landlord shall have an additional thirty (30) days from receipt of such notice to deliver the Premises to Tenant in the condition required hereunder, in which event this Lease shall continue in full force and effect. In the event that Tenant elects to terminate this Lease as stated above, the security deposit and all pre paid rent shall be returned immediately to Tenant. 4.2 EARLY POSSESSION. Should Landlord, in its sole and absolute discretion, tender possession of the Premises to Tenant in the condition required pursuant to Paragraph 4.5 hereof prior to the Scheduled Commencement Date for the operation of Tenant's business therein, such occupancy shall be subject to all of the provisions of this Lease. If Tenant or its contractor, employees, agents, or other licensees or invitees should otherwise enter, use, or occupy the premises, prior to commencement of the Original Term for the purpose of planning, performing tenant improvements, or otherwise preparing the Premises for Tenant's occupancy thereof, such entering, occupancy and use shall be subject to all of the provisions of this Lease except for the obligation to pay Rent. Notwithstanding anything to the contrary in this Paragraph (but subject to the preceding sentence) Landlord hereby agrees to permit Tenant access to the Premises for the purpose of installing Tenant's data and phone lines no later than sixty (60) days prior to the Commencement Date, and shall provide Tenant other access to the Premises for the purpose of Tenant performing minor improvements therein so long as Tenant's access does not materially interfere with the completion of the Landlord Improvements. To the greatest extent permitted by law, Tenant shall indemnify, defend and hold harmless Landlord and its agents, employees, and servants with regard to such early occupancy, except for Landlord's negligence or willful misconduct or as otherwise set forth in this Lease. 4.3 LANDLORD IMPROVEMENTS. Landlord will construct a laboratory build-out for the Phase I Premises ("LANDLORD IMPROVEMENTS") pursuant to plans submitted by Tenant to Landlord and reasonably approved by Landlord accomplished pursuant to the process devised in EXHIBIT "C" attached hereto, all of which shall be consistent with and represent logical evolutions of or development from the floor plan approved in writing by Landlord ("FLOOR PLAN"). The Plans (as defined in EXHIBIT "C") generally shall provide for the Landlord Improvements to be constructed in order to accommodate generally accepted reasonably generic biotechnical laboratory uses as described on EXHIBIT "C-1," except as Landlord and Tenant may otherwise agree. Tenant acknowledges that Landlord's approval of the Plans does not constitute any representation or warranty whatsoever concerning the suitability of the design of the improvements for Tenant's intended use or that the Plans will comply with Applicable Law. Tenant shall provide to Landlord such other information as Landlord may reasonably request for construction of the Landlord Improvements within five (5) days after written request therefor. Tenant acknowledges that Landlord may make changes to the Plans as required by Applicable Law or unforeseen circumstances with Tenant's prior written consent which consent shall not be unreasonably withheld. Any dispute concerning this Paragraph 4.3 shall be submitted to arbitration as required in PARAGRAPH 30.38 below. 4.4 PHASE II LANDLORD IMPROVEMENTS. Subject to Paragraph 4.6 below, Landlord shall deliver, and Tenant shall accept, the Phase II Premises in their as-is condition as of the Phase II Commencement Date. With regard to the Phase II Premises, Landlord shall construct Landlord Improvements under the same provisions as Paragraph 4.3 above and shall provide them to Tenant on the same terms and conditions as Paragraph 4.6 below for the portion ("PHASE II DESIGNATED PREMISES") of the Phase II Premises selected by Tenant (provided, however, that references in Paragraphs 4.3, 4.6 and EXHIBIT "C" to the "Effective Date" for a Phase II Designated Premises shall mean the date Tenant notifies Landlord of its intent to designate Phase II Designated Premises, and "Plans" shall mean the plans for the Landlord Improvements to the applicable Phase II Designated Premises). In order to designate a portion of the Phase II Premises as Phase II Designated Premises, Tenant shall give to Landlord written notice of such designation along with Plans and the Building Permit for the Phase II Designated Premises. The Plans for the Phase II Designated Premises shall be prepared in accordance with EXHIBIT "C." Upon Landlord's delivery of the Phase II Designated Premises with the Landlord Improvements complete pursuant to the Plans and the terms and conditions of Paragraph 4.6 hereof, the per foot Monthly Rent for the Phase II Designated Premises shall be increased to the same per foot Monthly Rent as the Phase I Premises; provided, however that in the event that the particular Phase II Designated Premises is not completed by the applicable Scheduled Phase II Designated Premises Commencement Date as defined below (except as a result of (i) Tenant delay, (ii) force majeure, or (iii) the inclusion of specialized improvements in the applicable Plans that are not consistent with EXHIBIT "C" hereof), the increase in Monthly Rent for such Phase II Designated Premises shall be delayed after completion of the applicable Phase II Designated Premises one day for each day of delay beyond the Phase II Designated Premises Commencement Date. Tenant may designate a Phase II Designated Premises on any two (2) separate occasions. Tenant shall not have the right to designate more than 25% of the Phase II Premises as Phase II Designated Premises after ____________. Further, if any portion of the Phase II Premises has not been designated as Phase II Designated Premises by _____________, Tenant shall no longer be able to designate such premises as Phase II Designated Premises. For the purposes of this Paragraph 4.4, the Scheduled Phase II Designated Premises Commencement Date for a Phase II Designated Premises shall be that date which is six (6) months following the receipt of a Building Permit for the applicable Phase II Designated Premises. 4.5 LANDLORD CONTRIBUTION. Landlord will contribute up to a maximum of $_____ per square foot of Floor Area of the Premises to complete the Landlord Improvements ("LANDLORD CONTRIBUTION"). Upon Tenant's written request, Landlord will increase the Landlord Contribution by up to an additional ___________ Dollars ($____) per square foot of the Floor Area of the Premises ("ADDITIONAL CONTRIBUTION") under the condition that Tenant shall increase the Deposit by a sum equal to fifty percent (50%) of the Additional Contribution, which increased deposit may be reduced by ten percent (10%) per annum provided Tenant is not in default hereunder. In the event Landlord funds the Additional Contribution, the per square foot of Floor Area Monthly Rent shall increase as of the Commencement Date by the product of the Additional Contribution and ________ divided by the Floor Area of the Premises. For instance, if the Additional Contribution for the Phase I Premises is $______, the per square foot of Floor Area Monthly Rent for the Phase I Premises would be $____ ($_____ + [$________ DIVIDED BY _______ DIVIDED BY ______]). All calculations of Monthly Rent shall be reasonably determined by Landlord and subject to Tenant's reasonable approval; provided, however, Tenant's approval shall be deemed granted if Tenant does not provide the basis for its objection in writing to Landlord within twenty (20) business days after receipt of Landlord's calculation. Prior to commencement of the Landlord Improvements, Landlord may require Tenant to deposit with Landlord an additional sum equal to the difference of the estimated cost to complete the Landlord Improvements and the Landlord Contribution ("TENANT IMPROVEMENT DEPOSIT"). The Landlord Contribution shall be allocated to the Phase I Premises and Phase II Premises based upon their respective Floor Areas. There shall be no Landlord Contribution or Additional Contribution for any portion of the Phase II Premises that is not designated as Phase II Designated Premises. The Landlord Contribution for the Phase II Premises shall be allocated among each respective Phase II Designated Premises based upon their respective Floor Areas. All additional costs of the Landlord Improvements in excess of the Landlord's Contribution and Additional Contribution shall be paid by Tenant, except to the extent such additional costs are caused by the grossly negligent acts or omissions of Landlord. The cost of the Landlord Improvements shall include without limitation the following: (i) all architectural and engineering fees, (ii) all plan check, permit, and license fees, (iii) all costs of construction of the improvements, including testing and inspection costs, hoisting and trash removal costs, and reasonable contractors' fees and general conditions, (iv) the costs of changes in the structural components of the Premises when such costs are required by the Plans, (v) costs of changes in the Plans required by Applicable Law, (vi) costs incurred to install separate meters for the provision of utilities, (vii) the reasonable costs of Landlord's construction manager and other consultants, and (viii) Landlord's administrative fee equal to two percent (2%) of all such costs. Landlord shall pay, Tenant shall have no responsibility for, and neither the Landlord's Contribution nor the Additional Contribution shall be used for, the following costs associated with the Landlord Improvements: (i) costs attributable to improvements installed outside the demising walls of the Premises (except for improvements related to Tenant's occupancy, such as mechanical enclosures, trenching, piping, etc. ); (ii) costs for improvements which are not shown on or described in the Plans unless otherwise approved by Tenant; (iii) costs incurred to remove Hazardous Materials from the Premises or the Project; (iv) costs in connection with disputes (including attorneys and expert witness fees) with third parties (including, without limitation, the general contractor); (v) costs incurred as a consequence of delay (unless the delay is caused by Tenant); (vi) costs recoverable by Landlord on account of warranties or insurance; (vii) penalties and late charges attributable to Landlord's failure to pay construction costs (provided Tenant makes timely progress payments as required under this Lease); (viii) costs to install exterior improvements and bring them into compliance with the Americans with Disabilities Act ; (ix) wages, labor and overhead for overtime and premium time unless agreed to by Tenant and Landlord; (x) off-site management of Landlord or other general overhead costs incurred by Landlord except as provided herein; and (xi) interest and other costs of financing construction. Landlord and Tenant agree that the cost of that portion of the Central Plant (as described in EXHIBIT "C-1") that is fairly allocated to the Phase I Premises shall be deducted from the Landlord Contribution and that any costs fairly allocable to the Phase II Designated Premises shall be deducted from the applicable Landlord Contribution for such Phase II Designated Premises. Landlord and Tenant shall reasonably agree to the amount of the Landlord Contribution allocable to the Central Plant, with all additional costs to be paid by Landlord. If Landlord and Tenant do not agree on the cost of the Central Plant allocated to Tenant, then Landlord shall install package units to the Premises as part of the Landlord Improvements. Landlord shall pay at its own expense the cost of removing the existing asbestos from the Premises. Tenant agrees that for tax reporting purposes, Landlord may allocate the Landlord Contribution in any lawful manner with regard to the Landlord Improvements. 4.6 CONDITION OF PREMISES. The Plans shall create no responsibility or liability on the part of Landlord for the completeness of such plans, or their design sufficiency, or compliance with Applicable Law. Landlord shall have no obligation to Tenant for defects in design, or materials of the Landlord Improvements. The Landlord Improvements shall be deemed substantially completed on the date on which Landlord delivers to Tenant (i) an occupancy permit (permanent or temporary) from the governmental agency responsible for issuing the same, and (ii) a certification from Landlord's architect or construction manager stating that the Premises are substantially complete and ready for occupancy, subject only to any remaining work on a "punchlist" thereafter to be completed by the Landlord's contractor which will not substantially adversely affect Tenant's ability to occupy and use the Premises (except for any specialty areas, e.g. the vivarium). Landlord warrants and represents that, as of the Commencement Date, (i) the Landlord Improvements for the Phase I Premises shall have been constructed in accordance with the provisions of Plans in accordance with this Lease, (ii) the Phase I Premises will be in good and clean operating condition and repair, (iii) the electrical, mechanical, HVAC, and other building systems serving the Phase I Premises will be in good condition and repair, and (iv) the roof of the Building will be in good condition and water tight; provided, however, as Tenant's sole remedy with regard to any violation of such warranty and representation, Landlord shall promptly after receipt of the Punch List (as defined below), diligently proceed to remedy any such punch list items. Except as specifically provided herein, TENANT HEREBY WAIVES ALL WARRANTIES, EXPRESS OR IMPLIED, REGARDING THE CONDITION AND USE OF THE PREMISES, INCLUDING, BUT NOT LIMITED TO ANY WARRANTY OF MERCHANTABILITY OR FITNESS FOR A PARTICULAR PURPOSE. Tenant agrees, that by taking possession of the Premises, it acknowledges that it has inspected the Premises, that they are in good condition, and that it accepts the Premises in their then current condition subject only to a punchlist of non-compliance with this Lease delivered from Landlord to Tenant within sixty (60) days after the Commencement Date ("PUNCH LIST"). Any provision of this Lease to the contrary notwithstanding, Landlord shall not be responsible for any defects as a result of the design and/or engineering of the Plans. Landlord shall assign to Tenant any applicable warranties from Landlord's contractors with regard to the Landlord Improvements. 4.7 TENANT DELAYS. Tenant agrees that, except as specifically provided herein, any request for approval by Tenant in connection with the construction of the Landlord Improvements which is not responded to with seven (7) business days after request shall be deemed granted. In the event that any action of Tenant, its agents, employees, invitees, or contractors unreasonably causes any delay in providing to Landlord the Plans as required under EXHIBIT "C" or in completion of the Landlord Improvements, Tenant shall be obligated to pay to Landlord the amount of Monthly Rent and additional rent which would be payable hereunder without such delay for the number of days caused by such actions. 4.8 TENANT'S CERTIFICATE. Following the Commencement Date, Tenant shall execute, acknowledge and deliver to Landlord a tenant's certificate in the form of EXHIBIT "E" ("TENANT'S CERTIFICATE"), within thirty (30) days of Tenant's receipt of the Tenant's Certificate from Landlord setting forth among other things the Commencement Date and the termination date of this Lease. Notwithstanding the foregoing, Tenant's failure to execute the Tenant's Certificate shall not affect Landlord's determination of the Commencement Date in accordance with the provisions of this Lease. Failure of the Tenant to execute and deliver the Tenant's Certificate in the form prepared by Landlord, with such corrections or additions as may be required, shall constitute an acceptance of the Premises and acknowledgement by Tenant that the statements included in the Tenant's Certificate are true and correct without exception. 4.9 FLOOR AREA. The term "FLOOR AREA" as used throughout this Lease shall mean and include the square footage of the Premises (or, where applicable, of all premises located in a building or buildings of the Project), measured to the drip line of exterior walls and to the center of party walls, including columns. Once Landlord has completed Landlord's Work, Landlord may measure the Floor Area of the Premises. Upon Landlord's reasonable determination of the exact Floor Area within the Premises, Landlord shall deliver written notice of such Floor Area to Tenant, and, in the event the Floor Area is different from that stated in PARAGRAPH 1 of this Lease, Tenant shall within ten (10) days after request of Landlord, execute an amendment memorializing the new Floor Area, Monthly Rent, and any other calculations based on the Floor Area which must be recalculated.